Bridal gowns accessories are fundamental to add fashion to your gown. We need to pay great attention in matching them, because they must be in line with the design of the gown and with the ceremony. The stylist, besides creating the marvelous bridal gowns, designs and makes different accessories to give a finishing touch of refinement to the gown. BRIDAL VEIL Among the bridal gown accessories the veil is the most loved and symbolic and it is crucial for the emotional effect on the scene of the ceremony. 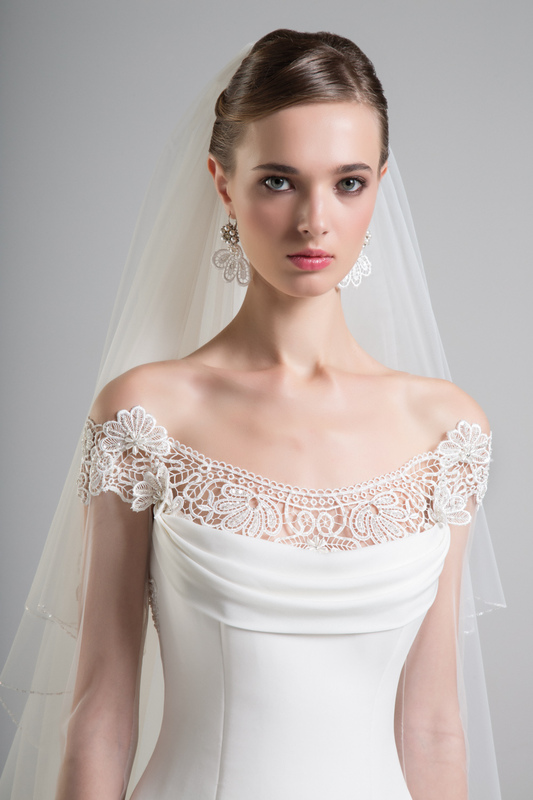 Either made of tulle or of lace, long or short, according to the gown design, the veil is still the most requested bridal accessory. BRIDAL HAIRSTYLE Once chosen the bridal gown we may start thinking about the hairstyle that will be frame to the face. Plain, soft, gathered, the hairstyle can be embellished with accessories characterized by the stylist, to create a personal style absolutely matching the gown and the features of the bride. BRIDAL GLOVES The elegance and refinement symbol accessory, gloves add a touch of style to the bride dreaming to wear them on her weddingday. The line of the gown defines the matching gloves: long or short, laceor fabric. BRIDAL SHOES Cult object for every woman, bridal shoes represent really their highest passion, reaching the top when made to match exclusively your own bridal gown. The stylist makes even this dream come true. BRIDAL CAPE One of the most popular bridal item, for both the aesthetic and the use of it. There are various models to wear during the religious ceremony, but to be used in autumn or winter as well – made of ecological fur, rabbit fur or mink fur – to protect the bride from cold. In Anna Tumas bridal atelier in Rome we make even more bridal accessories as purses, umbrellas and small pads to carry wedding rings, exactly matching the gown you chose.